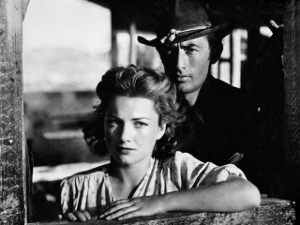 Gregory Peck stars in William Wellman’s (The Ox-Bow Incident, The Story of G.I. Joe) eerie western about a band of thieves that wander into a Death Valley ghost town where a young woman (Anne Baxter) and her grandfather have struck gold. Yellow Sky is about the uneasy relationship between the two parties, a matter complicated by visiting Apache Indians and infighting within Peck’s crew. The rough romance that forms between Peck and Baxter will make the PC police uneasy, but for films of the time, Baxter’s character is pretty tough and self-reliant. The supporting players — including Richard Widmark and Harry Morgan — are well cast and Wellman creates an austere, spooky atmosphere once you get to the ghost town. The only sour note is a tacked-on happy ending that must have been imposed by the studio.